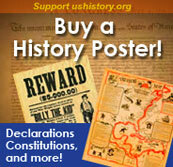 Andrew Jackson viewed Henry Clay, the Great Compromiser, as opportunistic, ambitious, and untrustworthy. 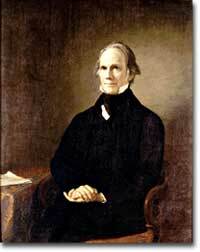 Henry Clay was viewed by Jackson as politically untrustworthy, an opportunistic, ambitious and self-aggrandizing man. He believed that Clay would compromise the essentials of American republican democracy to advance his own self-serving objectives. Jackson also developed a political rivalry with his Vice-President, John C. Calhoun. Throughout his term, Jackson waged political and personal war with these men, defeating Clay in the Presidential election of 1832 and leading Calhoun to resign as Vice-President. Jackson's personal animosity towards Clay seems to have originated in 1819, when Clay denounced Jackson for his unauthorized invasion of Spanish West Florida in the previous year. Clay was also instrumental in John Quincy Adams's winning the Presidency from Jackson in 1824, when neither man had a majority and the election was thrown into the House of Representatives. Adams' appointment of Clay as Secretary of State confirmed Jackson's opinion that the Presidential election has been thrown to Adams as part of a corrupt and unprincipled bargain. 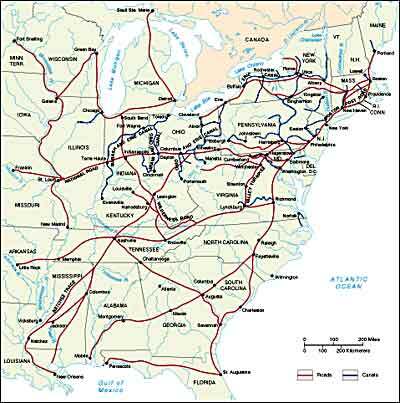 Roads and canals were built to across the nation during the early to mid-1800s. Clay's "American System" would have funded such improvements. Clay was called The Great Compromiser, and served in the Congress starting in 1806. He had a grand strategic vision called the American System. This was a federal government initiative to foster national growth though protective tariffs, internal improvements and the Bank of the United States. Clay was unswerving in his support for internal improvements, which primarily meant federally funded roads and canals. Jackson believed the American System to be unconstitutional — could federal funds be used to build roads? He vetoed the Maysville Road Bill, Clay's attempt to fund internal improvements. His veto of the Bank Recharter Bill drove the two further apart. Calhoun and Jackson held separate views on many issues, including states' rights. Jackson's personal animosity for Calhoun seems to have had its origin in the Washington "social scene" of the time. Jackson's feelings were inflamed by the Mrs. Calhoun's treatment of Peggy, wife of Jackson's Secretary of War, John Eaton. Mrs. Calhoun and other wives and daughters of several cabinet officers refused to attend social gatherings and state dinners to which Mrs. Eaton had been invited because they considered her of a lower social station and gossiped about her private life. Jackson, reminded of how rudely his own wife Rachel was treated, defended Mrs. Eaton. Many political issues separated Jackson from Calhoun, his Vice President. One was the issue of states rights. Hoping for sympathy from President Jackson, Calhoun and the other states-rights party members sought to trap Jackson into a pro-states-rights public pronouncement at a Jefferson birthday celebration in April 1832. Some of the guests gave toasts which sought to establish a connection between a states-rights view of government and nullification. Finally, Jackson's turn to give a toast came, and he rose and challenged those present, "Our Federal Union — It must be preserved." Calhoun then rose and stated, "The Union — next to our liberty, the most dear!" Jackson had humiliated Calhoun in public. The nullification crisis that would follow served as the last straw. Jackson proved that he was unafraid to stare down his enemies, no matter what position they might hold. Henry Clay, the Great Compromiser, made no compromises when it came to his beloved estate Ashland. The mansion set on an estate of 600 acres is stunningly elegant, as is this website. There is information on all facets of Clay's life, from his career in Congress, to his love of horse racing. The page is broken down into subsidiary parts which include "History of the Estate," "The Grounds," and a "Biography of Henry Clay." Save time to stroll around this site in a leisurely fashion. A young flirtatious Irish immigrant, a tavern keeper's daughter, and a woman whose manner caused one of the biggest scandals in the Jackson administration, Margaret "Peggy" Eaton was quite a woman. This article shows how the petty gossip of senators' wives infiltrated the highest circles of Washington politics, causing Daniel Webster to declare, "It is odd enough that the consequence of this dispute in the social...world, is producing great political effects, and may very probably determine who shall be successor to the present chief magistrate." Our Federal Union: It must be preserved. "One man with courage makes a majority." "It's a damn poor mind that can think of only one way to spell a word!" Andrew Jackson was one of the United States's most quotable presidents. Check out this list of famous sayings from America's 7th President which range from funny to profound. Western states — fed up with despotism — are attempting a rollback of federal power ... Once again, the spirit of John C. Calhoun stalks the land. -Patrick J. Buchanan "States Rights Rebellion," July 23, 1994. Henry Clay was appointed Senator from Kentucky when he was only 29 — a full year younger than the Constitution says a Senator must be to hold office. Still causing a ruckus in her old age, a 59-year-old Peggy Eaton married a dance teacher who was 40 years younger than she.